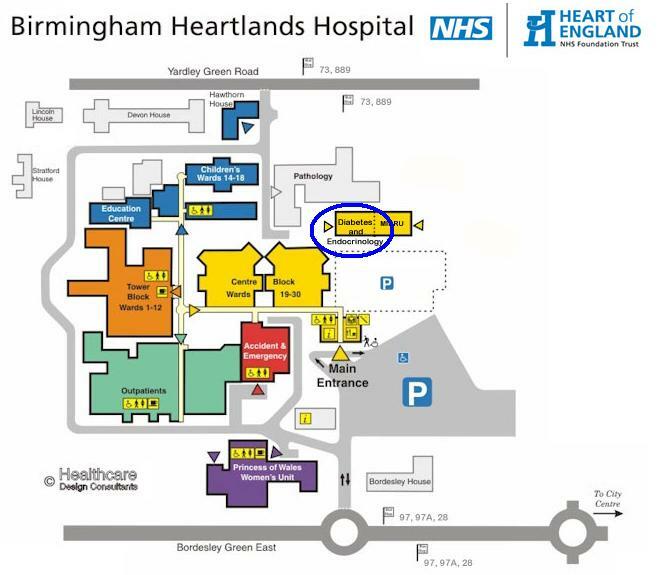 Heartlands Hospital is on Bordesley Green East, 1 mile from the A45 Coventry Road. It is within easy access of junction 6 of the M42 and junctions 5 and 6 of the M6. From Birmingham City Centre, it is approximately 2 miles past the Birmingham City Football Ground. For sat-navs use postcode B9 5SS to arrive at the car park entrance. Car parking is available on the visitors’ car park at Heartlands and is currently charged at £10.20 per day. Weekly passes may be available. Click here for up to date parking fees and information. The 97 and 97a service departs from Moor Street Queenway (stop MS8) in the centre of Birmingham throughout the day. The stop is opposite Moor Street train station. Other services are available from other parts of the city and surrounding areas. The nearest train station to Heartlands is Stechford which is 2 miles away. Alternatively, the 97/97a bus stop is a short walk from the main stations (New Street, Snow Hill and Moor Street) and hotels in central Birmingham. Many of our course delegates choose to stay in the Broad Street area of Birmingham as it is close to the town centre and has a variety of restaurants nearby. This is also the main hotel area of the city. As we don’t give recommendations, the Visit Birmingham site has some information on what is available or just use your preferred hotel group or finder site. The Retinal Screening Department is based on the first floor of the new Diabetic and Endocrine Department. This is the new grey building visible to the right of the Main Entrance. The Diabetes entrance is on the LEFT side of the building. Access to the building is via SWIPE CARD. Therefore if you wish to leave at break times, please ask a member of the grading team for a card.